When crossing a water course on a fence rail or small log, do not face up or down the stream and walk sideways, for a wetting is the inevitable result. 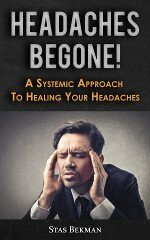 Instead, fix the eye on the opposite shore and walk steadily forward. Then if a mishap comes, you will fall with one leg and arm encircling the bridge. --C. C. S.
In cases where batteries are used in series and it is desirable to change the strength and direction of the current frequently, the following device will be found most convenient. In my own case I used four batteries, but any reasonable number may be used. Referring to the figure, it will be seen that by moving the switch A toward the left the current can be reduced from four batteries to none, and then by moving the switch B toward the right the current can be turned on in the opposite direction to the desired strength. In the various positions of these two switches the current from each individual cell, or from any adjacent pair of cells, may be used in either direction. --Contributed by Harold S. Morton, Minneapolis. Many of the Bulgarian peasants do their cooking in the open air over bonfires. The illustration shows a laborsaving machine in use which enables the cook to go away and leave meat roasting for an hour at a time. The illustration shows how the spit to which the meat is fastened is constantly turned by means of a slowly moving water wheel. Some of our readers may wish to try the scheme when camping out. The success depends upon a slow current, for a fast-turning wheel will burn the meat. 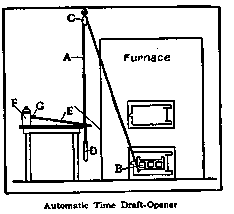 A simple apparatus that will open the draft of the furnace at any hour desired is illustrated. The parts are: A, furnace; B, draft; C, draft chain; D, pulleys; E, wooden supports; F, vertical lever; G, horizontal lever; H, cord; I, alarm clock; J, weight. K shows where and how the draft is regulated during the day, the automatic device being used to open it early in the morning. The spool on the alarm clock is fastened to the alarm key by sawing a slit across the top of the spool and gluing it on. When the alarm goes off a cord is wound up on the spool and pulls the horizontal lever up, which releases the vertical lever and allows the weight to pull the draft open. --Contributed by Gordon Davis, Kalamazoo, Mich.
An electroscope for detecting electrified bodies may be made out of a piece of note paper, a cork and a needle. Push the needle into the cork, and cut the paper in the shape of a small arrow. Balance the arrow on the needle as shown in the sketch, and the instrument will then be complete. If a piece of paper is then heated over a lamp or stove and rubbed with a piece of cloth or a small broom, the arrow will turn when the paper is brought near it. --Contributed by Wm. W. Grant, Halifax, N. S., Canada. The dogs in my neighborhood used to come around picking up scraps. After I connected up my induction coil, as shown in the sketch, we were not bothered with . A indicates the ground; B, switch; and C, a bait of meat, or a tempting bone. --Contributed by Geo. W. Fry, 903 Vine St., San Jose, Cal. The rack is made of any suitable kind of wood, and the sides, A, are cut just alike, or from one pattern. The shelves are made in various widths to fit the sides at the places where they are wanted. The number of shelves can be varied and to suit the size of the dishes. Cup hooks are placed on top and bottom shelves. It is hung on the wall the same as a picture from the molding. --Contributed by F. B. Emig, Santa Clara, Cal. 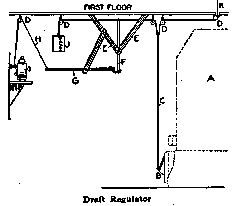 A stout cord, A, is attached to the draft B of the furnace, run through a pulley, C, in the ceiling and has a window weight, D, attached at the other end. A small stick is put through a loop in the cord at about the level of the table top on which the alarm clock F stands. The other end of stick E is placed under the key G of the alarm clock. When the alarm rings in the early morning, the key turns, the stick falls away, releasing the weight, which pulls the draft open. --Contributed by Edward Whitney, 18 Gorham St., Madison, Wis.